You’ve found your dream home, a 1920’s villa, its picture perfect; but is it insurable? So what is the deal with older homes? Before the early 1930’s in New Zealand some councils had their own building bylaws, while others had no requirements at all. In 1931 the Napier earthquake changed everything. It become evident that some of the construction methods used, including unreinforced masonary, were unsuitable in a country built on fault lines. In December 1935 the first uniform set of building standards were implemented in New Zealand. It’s common for older homes to have foundation issues. Sagging or wavy floorboards is the giveaway to problems with the piles. Check under the house for cracks and signs of shifting, or decay in timber piles. Mould can also be an early warning sign of weak foundations and other problems. 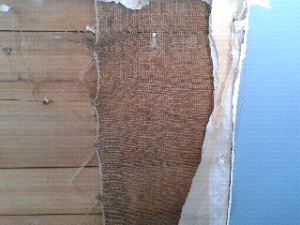 Scrim is sacking (think hessian) that is stapled to thin wooden strips known as Sarking. Think of it as kindling and newspaper, the perfect fire starter. Scrim and Sarking is effectively the wall board that the wallpaper attaches to. It is likely that over the past 100 odd years, it will have been wallpapered over, and possibly painted multiple times. To test if your property has scrim wall boards you can use the knock test – Scrim will sound like you are knocking on wood, it will be near impossible to distinguish any studs. You could also use the floating wallpaper test – with age the hessian Scrim will starts coming away and give the impression of floating, bulging or twisting wallpaper. Check for this in room corners. Finally you could try a close inspection – you can sometimes see rough sawn board (Sarking) or hessian (Scrim) where wallpaper is loose or has come away, or the wallpaper will look ‘textured’ as the woven hessian fabric has imprinted the wallpaper from underneath. If your home is brick, chances are it is unreinforced double brick, the brick walls provide both the structure and the exterior cladding. After the 1931 Napier earthquake, regulations prevented brick from being used as a structural element. Unfortunately these buildings do not fair well in an Earthquake. Weatherboard’s were originally constructed from native timber, and unlike modern materials require a lot of maintenance, including regular painting. Unmaintained weatherboards will begin to rot over time, which will reduce weather tightness. An iron roof is expected to least about 50 years. As a roof ages flashings will corrode and loosen, nails will go missing and leaks will develop. Good maintenance and painting will get you so far, but eventually it will need to be replaced. Unreinforced masonry chimneys are a hazard to the home, and to anyone, and anything near your home. It is not uncommon for 100 year old brick chimneys to come crashing down on the house, cars and people during earthquakes and storms. If the fireplace is unused these should be removed to the roofline. If the fireplace is still in use, then the chimney should be check for its stability and reinforced if required. If the house has old pipes, they may need replacing due to mineral build up, leaks or corrosion. Make sure you closely inspect any exposed pipes to see if they’re properly working. Mineral buildup won’t be that noticeable until you’re trying to have a shower and wondering why not much water is coming out. Original plumbing pipes would have been copper and may still be in good condition. However when upgrading to mains pressure pipework and fittings may not have the ability to cope with the additional pressure. If replumbing was carried out during the late 1970s and early 1980s, a particular type of black plastic pipe (Dux Qest) was likely to have been used. After a short time the product was taken off from the market because there were numerous incidents of pipes bursting and causing considerable damage. If there is black plastic piping from a renovation dating from this period, it will need replacing. In 1888 Reefton (in the South Island’s West Coast) was the first town in the country to be connected to the public grid; surprisingly the power was supplied from a hydroelectric power station, not a coal power plant. By 1910 locally generated electricity was widespread. The earliest wiring was cloth-wrapped rubber insulated in metal conduit. It was designed for a very small number of outlets. In the 1930’s rubber wrapped wiring (with an earth wire) was used without conduit. This wiring deteriorated as the rubber insulation perished and became brittle. Many homes would have been rewired in the 1950’s and 1960’s with PVC or early versions of TPS wiring. This is also known to deteriorate over time, and wasn’t designed to be covered by insulation. Homes have more lights, electronics, gadgets, and appliances (including some that are permanently on standby) than anyone from the 1900’s could ever have imagined. The original wiring was not designed to handle this load, and was not built to last. Most fires we see are electrical. Couple deteriorated wiring with Scrim and Sarking and you’ve got yourself a bonfire ready to go. What are the minimum requirements for initio? For the reasons above old homes are a little riskier. Initio can provide an instant quote and insurance cover online for houses that are built in 1935 or after. To insure a houses built prior to 1935 we will need to provide a bespoke solution. If following applies to your pre 1935 property then we’ll probably be able to insure you. – Wall Linings; All scrim and sarking removed and relined with gib board or similar modern material. – Exterior Cladding; no outstanding maintenance. – Roof; replaced within the past 30 years and repainted in the past 10 years, or confirmation in good condition. – Plumbing; Replaced with PVC piping in the past 30 years or checked and confirmed in good condition. – Electrical; Fully rewired (including switchboard with circuit breakers) in the past 20 years as confirmed by a registered electrician. How do I get a quote to insure my older home? Please complete the linked Pre 1935 Declaration and email to info@initio.co.nz with recent photos of the home. We will then confirm if we can provide insurance on your home. If you don’t know when the property was renovated or what work has been completed, then it is best to obtain a building report and include this in your email. In the mean time, if you would like an indication on the cost to insure your pre 1935 house use our home insurance quick quote calculator and select 1935 – 1944 as the age range. Landlord insurance – all in one house and landlord insurance, including loss of rents, malicious damage & more. Multi unit insurance – for serious landlords with multiple units under the same roof. Home insurance – for your own home, and contents.